The Haunted Vineyard had been going strong for several years before we discovered it in 2004. Unfortunately, it closed in 2006. Although it is no longer in operation, we preserve this webpage as a tribute to one of our favoites that has shuffled off this mortal coil and gone to the great beyond where Halloween lives forever in timeless memory. DATES & HOURS: Nevermore! This excellent haunt closed its doors due to zoning issues. If you want to know what you missed, read our write-up of the 2005 incarnation. BARGAINS: $2 off coupons (not good for Halloween Night). Also, after you've gone through once, your ticket stub granted readmission to the maze for $5 (on the same night). FEATURES: Like the old Spooky House, this stand-alone haunted attraction was located in a permanent facility (an actual old winery). This provided excellent atmosphere and allowed for year-round planning and for greater detailing of sets. There were great environments, both indoors and outdoors, along with dozens of thrilling and (above all) fun scares; in fact, during its run, it was a contender for the single best walk-through maze in Southern California. 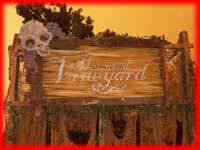 LOCATION: Situated across from a dirty parking lot, The Haunted Vineyard was located off a small street (barely more than an alley) dotted with dilapidated houses and a winery. By day, it merely looked drab, but at night it felt as if you were lost in the middle of nowhere and entering some backwoods nightmare -- not quite TEXAS CHAINSAW MASSACRE territory, but close enough. ALSO OF NOTE: In order to maximize the scares, the staff insisted that visitors enter in small groups (usually two or three). This led to long lines on busy weekends, so it was a good idea to arrive early, especially late in the Halloween season. Check out our archive of articles on the Haunted Vineyard.